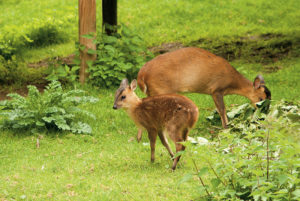 How and where to spot Muntjac Deer in Harrow, London. 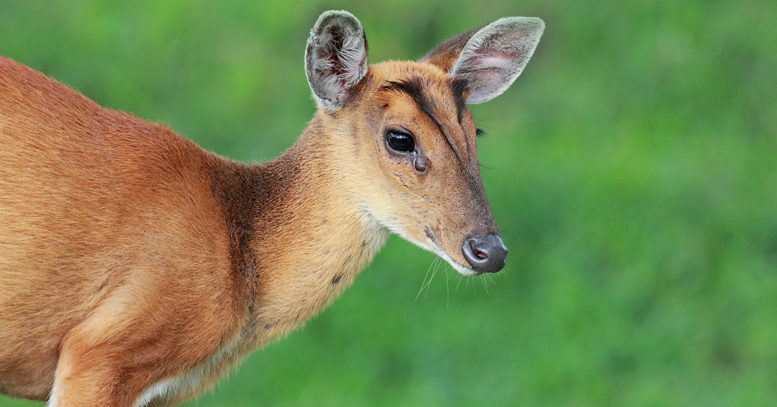 Muntjac deer, also known as Mastreani deer and barking deer, (given their repeated loud bark) are exotic looking deer, that can grow up to 52cm at the shoulder and weigh up to 16kg. You can often hear the male buck deer giving a loud bark, the females and kids however, tend to let out squeaks. When a muntjac is startled however, it may well let out a high-pitched scream. One of the oldest known breed of deer, Muntjacs look small, stocky and, due to slightly higher haunches, they appear hunched over, Facially, Muntjacs have a ginger forehead with black lines. These lines run up to the antlers on the bucks, but in the does they create a diamond shape on their forehead. The colouring of a Muntjac varies during the year, with them appearing a russet brown in summer, whilst in winter, they turn a shade of grey/brown. Muntjacs have visible upper ‘tusks’, that are really downward pointing canine teeth, and they use these for fighting. The bucks have short unbranched antlers, that can grow up to 10cm long. These antlers can be regrown. Male Muntjacs can live up to 16 years, whereas the females can live up to the age of 19, although this is rare. Muntjac deer are generally solitary or in pairs, with the bucks defending small territories. The does however, can have overlapping territories and several bucks, as they don’t pair-bond. They do not have a defined breeding season (or ‘rut’). They can breed all year and the does are able to conceive within a few days of giving birth. They have a gestation period of seven months and can begin breeding from as early as seven months old. Originally from south-east China and Taiwan, they were introduced in England, when they escaped from the Woburn Abbey estate in Warwickshire, in about 1925, and a large feral population then rapidly spread throughout south and central England and into Wales. Unlike other deer, they do not cause significant damage to agricultural and timber crops, however they are partial to primulas! They like deciduous and conifer woodland areas, but can also be found in some gardens. If you want to see a Muntjac deer, you’re more likely to be successful if you keep your eyes peeled during the dusk and dawn periods, even though they are active throughout any 24-hour period – as evident by those seen here at Grim’s Dyke.